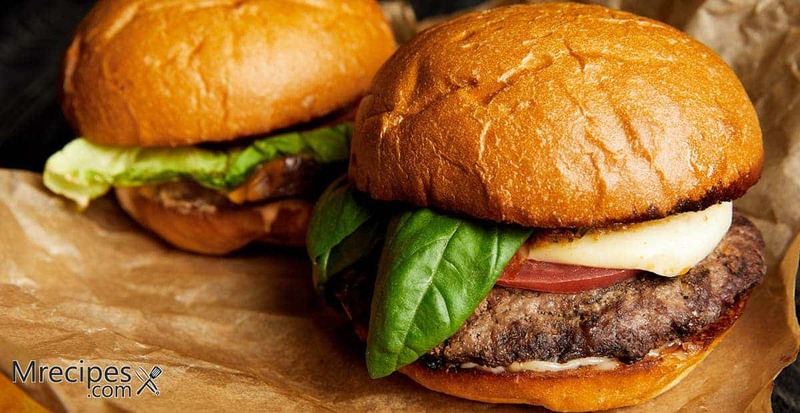 It may seem like a waste of time to smoke hamburgers, especially if you have hungry kids who lack patience when they smell burgers being grilled in just a few minutes. But, it is worth the extra cook time and a minimal amount of planning ahead. These are great in a Masterbuilt Electric Smoker that can hold a lot of burgers at once. For the 2 recipes here we’ll use ground chuck because of its 20% fat content to keep the burgers juicy. You can certainly use ground brisket or a mixture of marbled Wagyu and lean sirloin. Just try to get close to an 80/20 mix of lean to fat. The first recipe is for basic hamburgers that you can top with cheese. The second one is for stuffed burgers that are then glazed with barbeque sauce. You can use either hickory or mesquite wood chips for a really smoky flavor. Serve your burgers on soft or Kaiser rolls topped with your favorite condiments and vegetables with chips and pickles on the side. 1. Remove 2 wracks from the smoker to place the burgers on. Prepare your smoker by adding wood chips to the tray and water to the bowl. Preheat the smoker to 225°F. Open the top vent. 2. Form the ground beef into 1/2″ thick patties that are approximately 5 to 6 ounces of meat each. Place the patties on the racks and generously season both sides with salt and pepper. 3. Place the racks into the preheated smoker. Smoke the burgers for 60 to 90 minutes until they reach on internal temperature of 150 to 160°F. Check the burgers at 60 minutes. Add more wood chips and water if needed. 4. If you want cheese on your hamburgers, place it on top of each patty when there is approximately 10 to 15 minutes of smoking time remaining. Smoke for the remaining minutes with the cheese on top. 5. Serve the burgers with toppings, such as sliced onions, lettuce, tomatoes, ketchup, or mustard. 1. In a sauté pan, heat the EVOO to medium-high. Add the onions, mushrooms, and garlic. Cook until wilted stirring occasionally, approximately 15 minutes. Set aside to cool. 2. Remove 2 wracks from the smoker to place the burgers on. Prepare your smoker by adding wood chips to the tray and water to the bowl. Preheat the smoker to 225°F. Open the top vent. 3. Take approximately 3 TBS of ground beef and form into a 1/4″ thick circular patty. Do this to make 10 to 12 patties. 4. Spoon equal amounts of the onion and mushroom mixture onto half of the patties. Top with some crumbled blue cheese. Place the other patties on top and close the edges of the burgers to surround the stuffing. Use your hands to do this. Place the hamburgers on the racks and season both sides with salt and pepper. 5. Place the racks into the preheated smoker. Smoke the burgers for 60 to 90 minutes until they reach on internal temperature of 150 to 160°F. Check the burgers at 60 minutes. Add more wood chips and water if needed. When there is 10 minutes remaining of smoking time, brush some barbeque sauce on the tops of the burgers and continue to smoke. 6. Serve the burgers on thick rolls with fresh green toppings, such as shredded iceberg lettuce, baby arugula, or frisée leaves. Hamburgers don’t have to be beef, especially when it comes to smoking them. Here are a couple of ideas you can experiment with. Season with salt and pepper before placing in the smoker. Smoked Lamb Burgers with Feta: Lamb burgers will smoke in the same time as beef. I like to mix some crumbled feta and dried rosemary into the lamb before making the patties. Smoke as you would the basic beef patties to an internal temperature of approximately 155°F. Serve with lettuce, tomato, and thousand islands dressing or a yogurt sauce, such as tzatziki. Smoked Turkey Burgers with Veggies: Turkey burgers can be dry because of the low fat content of the ground meat. It is best to use ground turkey thigh meat. Add in some thinly sliced scallions, diced roasted red peppers, garlic powder, a few dashes of Worcestershire sauce, and a couple of tablespoons of EVOO to the minced meat. Smoke for approximately 15 to 45 minutes longer than beef burgers to an internal temperature of 165°F. Do not undercook poultry. Serve these with a mildly spicy chutney chutney and some crunchy potato chips on top. Yes, chips on a burger are good and add a little fat. Just push the top bun down to smash them. Even BBQ chips are good.